After months of frequent eruptions in western Sumatra, another volcano on Indonesia’s most densely populated island of Java has put hundreds of thousands of lives at risk after erupting twice late Thursday night. Unlike last month’s Mount Sinabung eruptions – which displaced roughly 20,000 villagers who had been living within the volcano’s 7-kilometer danger zone – yesterday’s twin eruptions have forced Indonesian authorities to evacuate more than 200,000 people living within a 10-kilometer radius of Mount Kelud’s peak. The Jakarta Globe reported that a column of smoke and ash stretching 10 kilometers into the atmosphere could be seen after the initial blast. There were reports of gravel being thrown as far as 50 kilometers from the volcano’s open crater. The current 10-kilometer evacuation zone was increased from just five earlier this week, prompted by warnings from the country’s Volcanology and National Disaster Mitigation Agency. Residents began fleeing the area on Thursday afternoon. Though no deaths have been reported in Java, at least 16 were killed by Mount Sinabung’s violent activity in January. Regional air travel has been crippled by the closure of three airports near the volcano – Juanda Airport in Surabaya, Adisumarmo Airport in Solo and Adisucipto Airport in Yogyakarta. Yogyakarta, a city of nearly 400,000, lies 200 kilometers away from Mount Kelud. The Indonesian government has already established 78 disaster shelters for residents displaced by the eruptions – the first since a minor eruption in 2007. Mount Kelud’s last major eruption was in 1990. Hot air and lava left 30 dead and hundreds injured. Before that, a massive 1919 explosion – that could allegedly be heard hundreds of miles away – claimed the lives of more than 5,000. 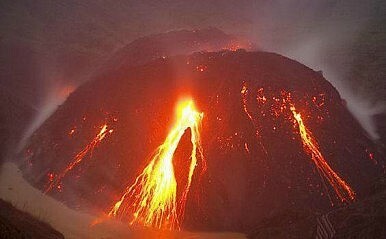 The year 1568 saw what was likely the volcano’s deadliest eruption, killing 10,000. Mount Kelud is just one of about 130 active volcanoes in Indonesia – the world’s fourth most populated country ranks number one for volcanic activity.